Happy Thursday! This is a busy week! New fabric yesterday, and new patterns today! It's funny how things stack up sometimes! I wasn't sure if I'd be able to pull anything together for this Spring, but here we are, and I have two new quilt patterns for you! Available for wholesale as well, email me for details. My newest full size pattern is Geese in Flight. 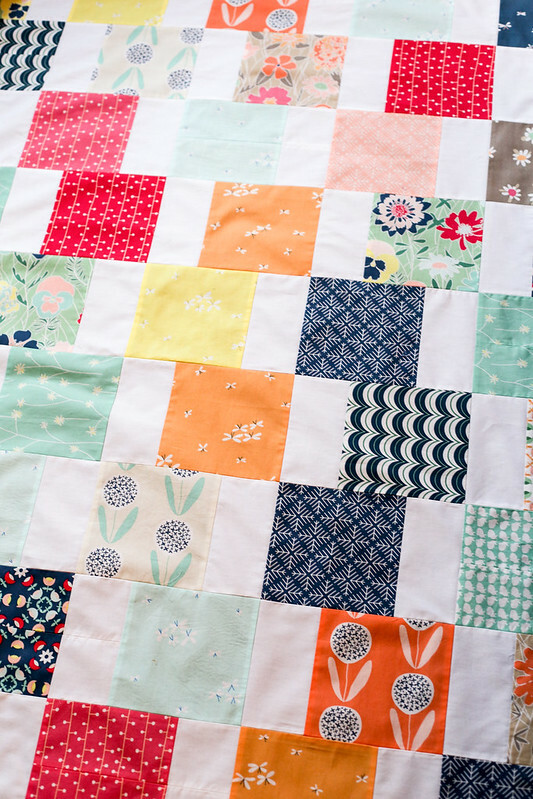 This quilt may look familiar to you, it graced the cover of Issue 3 of Love Patchwork & Quilting about a year and a half ago! 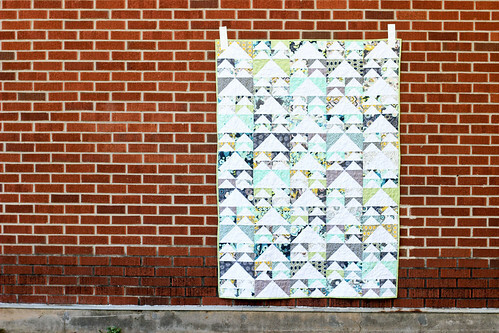 I love this quilt, and now that it's harder to find that issue, I've decided to release it as a stand alone pattern! Geese in Flight features traditional flying geese blocks, with no sashing or borders. 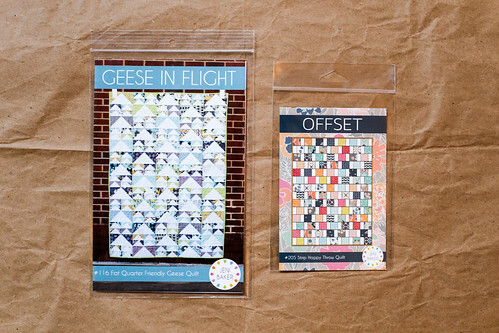 Learn to make no-waste flying geese and show off your favorite fabrics. There are five sizes to choose from, so you have lots of options! 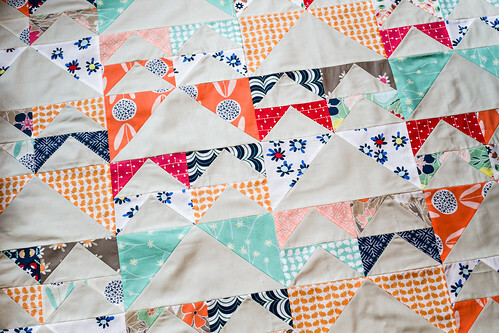 The original quilt is stitched up in Urban Mod by AGF In-House, with Pure Element Snow for the solid. I'm currently stitching up a baby quilt with it using some Curiosities strikeoffs. It came together so fast. Now to decide how to quilt it! Geese in Flight is available as a PDF and Printed Pattern. My new postcard pattern is Offset. This pattern is a bit of a twist on a design I did for Quilty, nearly two years ago! You can see the original version here. I switched things up a bit, and the result is a quick and easy strip quilt! As with all my mini patterns, the quilts are very beginner friendly and don't use a ton of fabric. Offset finishes at 61” x 84”. 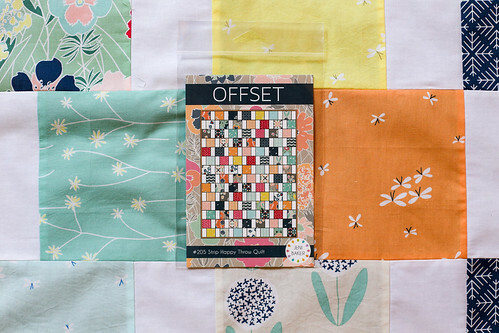 Offset is available as a PDF and Printed Pattern. If you're a shop interested in carrying Curiosities, it can be ordered through Art Gallery Fabrics. Find your sales rep here, or call toll-free (888) 420-5399. Love both! 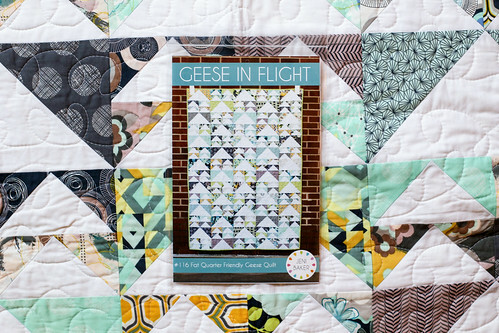 My Mom is actually just working on the Geese in flight quilt based on the magazine and it is coming along really beautiful!